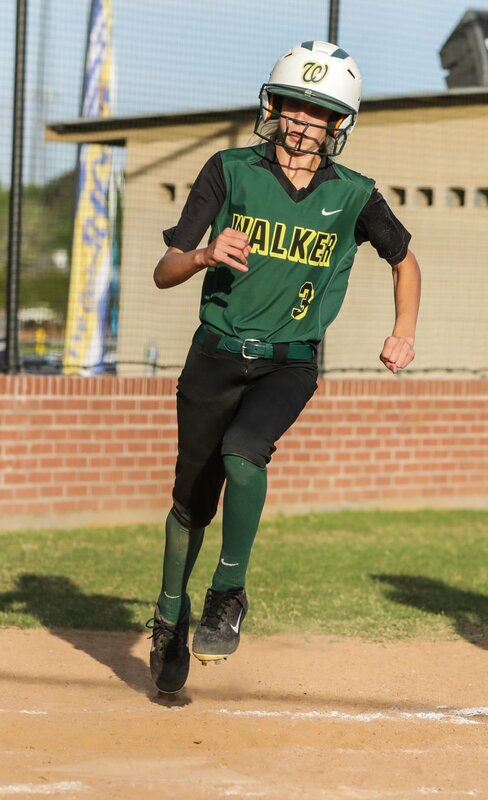 Walker High right fielder Gyvan Hammons crosses home plate for a run. Walker High's Lainee Bailey prepares to deliver a pitch. Live Oak designated player Elaina Kreamer (33) squares up a pitch. Walker High third baseman Haleigh Pourciau times her swinging at a pitch. Live Oak's Sophia Foster (7) came in relief and only allowed one run 2.1 innings of work. Walker High first baseman Ryann Schexnayder fouls off a pitch down the third base-line. Live Oak reliever Emalea Dimaio (23) prepares to deliver a pitch. Live Oak first baseman Emma Trippi (16) lays down a bunt. Live Oak third baseman Jenae Adams (15) remains patient on a pitch low in the strike zone.